Holding a dumbbell in each hand, sit on a bench inclined at 45 degrees and rest one dumbbell on each knee. As you lie back on the bench, kick the dumbbells up, one at a time, into place. Position the dumbbells to the sides of your chest, with your elbows bent and tucked in to your torso a little. Spread your legs and place your feet flat on the floor. Inhale as you lower the dumbbells back to the starting position, or until you feel a mild stretch in your chest. Use a bench inclination of 45 degrees because, when compared with other angles (0, 28, and 56), the clavicular head of the pectoralis major was found to be most active at 44 degrees, and 45 degrees is the closest setting. Raise the seat of the bench a little to prevent yourself from sliding down. Planting your feet, tucking in your elbows a little, and straightening your wrists allow you to drive from your legs, through your body, and up through your arms, thus getting your entire body behind the press. Tucking your elbows in a little also reduces the pressure on your shoulders. Try not to drop the dumbbells on the floor, by your sides, after you have finished. Instead, raise your knees and carefully bring the dumbbells down onto them. The weight of the dumbbells will then push your legs down and help you to sit up. 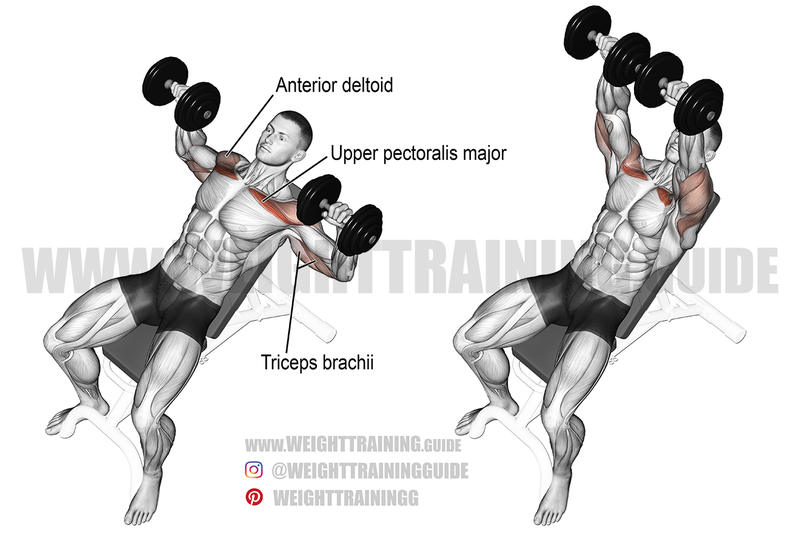 You can perform the incline dumbbell bench press unilaterally (one arm at a time), which will force the recruitment of more core stabilizer muscles and help you to develop unilateral strength. In order to enjoy the benefits of both unilateral and bilateral training, alternate between the two variations. This never works for my upper chest, it just works for my shoulders. What is a better workout for upper chest?? This is the best site for exercise and workout advice. Thanks, from New York City! Such encouraging words! Thanks, Hank. Has to be my fave chest movement. Shoulder got destroyed by barbell bench press. Dumbbells better.